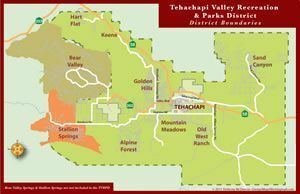 Welcome to the Tehachapi Valley Recreation & Park District! More easily than ever before you can find a park, see a trails map, check pool hours, sign up for a fitness or wellness class, register for one of our many programs and events, inquire about volunteer opportunities, and support present and future recreation and parks throughout the Greater Tehachapi Area. As “ambassadors of community wellness and active living” we at TVRPD know that efficient accessibility to positive, life-long experiences through inclusive recreational programming, events and parks are key to patron participation and community wellness. In response to this the TVRPD website affords 24 hour/7 day a week remote registration and secure online payments, whenever it is convenient to you, the park patron. In addition to rapid registration to programs, events and classes, patron’s can change or drop classes, request refunds and manage their accounts online. Through the TVRPD website the registration process is expedited and once you are in the system all subsequent registrations are simplified and rapid. Additionally email and physical addresses collected in the registration process affords the patron rapid updates on upcoming programs, classes, and events as well as closures and cancelations. Virtually everything about your recreation and parks system is here at your fingertips via home computer, laptop, iPad or smartphone! We intend to add even more interactive features to add convenience, expand accessibility and inspire stewardship. As our community grows, so does demand for beautiful public places. Even with shrinking operational budgets, TVRPD staff remains committed to being accessible to you through our website and providing high quality park facilities and diverse recreation programs that everyone can enjoy. Be sure to bookmark www.tvrpd.org on your computers and mobile devices. And please check back often and discover how the Tehachapi Valley Recreation and Park District makes life better in the Greater Tehachapi Area! Play Up! Live Up! The Tehachapi Valley Recreation and Park District enriches lives and fosters harmony within the community through area-wide leisure services targeted to improve healthy life styles, educational and recreational opportunities, public participation, and environmental and economical stewardship. We accomplish this through community outreach, quality programming, activities and events, and well-maintained parks and facilities, and an aesthetically pleasing environment that is provided by professional and caring employees, contractors and volunteers. Establish TVRPD within the community by adopting and developing sustainable practices to assist the District in its goal of impacting social, environmental and economic evolution of the Greater Tehachapi Area. TVRPD will establish baseline studies that measure the effectiveness of the steps taken to encourage sustainable lifestyles. Baseline studies will assist in future planning of projects and services.